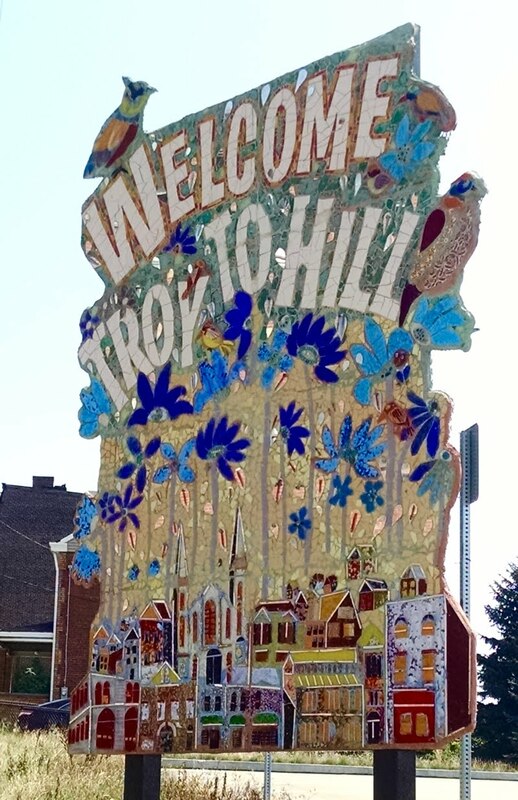 We've been waiting and waiting to see this mosaic that welcomes people to the Troy Hill neighborhood. In 2013 we had heard it might finally be installed, so we put up the placeholder on our map with a guestimate for the location based on some articles and what artist James Simon had been told. Then in 2014 we saw this Post Gazette article explaining why it still sat in Mr Simon’s basement. 2015 looked promising since the road work on Rt28 was completed. The new bike/pedestrian trail along the road opened and yet still nothing. FINALLY we discovered that it was installed in 2017! So happy this one has finally gotten to see the light of day. This is the third neighborhood in the area lucky enough to have a welcome sign done by Mr Simon.